I've been making quiche on a fairly regular basis lately, it started out as a way to use up some leftover pastry and smoked salmon after Christmas and has evolved into a regular menu staple. I had forgotten what a lovely comfort food quiche can be and am now kicking myself for not making it more often in the past. 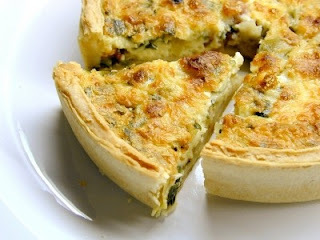 Quiche has been around for a long time, generally considered a French dish the earliest records for savoury custards are found in 14th Century England. The original quiche were savoury custards with the addition of bacon, cheese came along later and God only knows when the broccoli and asparagus started to show up. Quiche was so ubiquitous in the late '70s and early '80s that a tongue in cheek psycho babble book entitled Real men don't eat Quiche was a best seller in 1982-83, the premise being that quiche was wimpy and not masculine enough. Well I can tell you real men not only eat quiche, they make it. Quiche is dead easy to make, and is a superb vessel for left over ham, chicken, shrimp, salmon whatever. You can either make a simple Pate' Brisee, or if you are lazy buy frozen deep dish pie shells from your grocer. Proof your crust by covering it with foil and weighting down the foil with dry beans, cook for 12 minutes in a 450 degree oven then remove and carefully take out the beans, they may be reused for the proofing process in the future. Reduce your oven to 325 degrees and prep the filling, I use 5 eggs, a cup and a half of warm milk, homo not skim, or even creamo. Beat the eggs and milk together with salt and pepper and add a cup or so of grated full flavoured cheese, gruyere, emmenthaler, aged cheddar are all good and whatever else you want, ham, bacon, shrimp, crab are all great, I usually add sauteed, not browned onions and something herbaceous like sage or dill depending on what else is in the mix, Place the pieshell on a baking sheet and fill it with the custard mix and then bake for 40 minutes, let it cool and serve warm or at room temperature with salad or roasted broccoli and dinner/lunch is served. The beauty of quiche is that the egg, milk mix is the only constant, the other fillings are based on what you like and what you have on hand so it never gets boring and it's great for cleaning out the fridge. I'm surprised more restaurants don't feature a daily quiche at lunch, it's delicious and great for the food cost as the bits of whatever can be magically transformed into a saleable item, much like Seafood Pasta. Wine pairing is a snap as well, the rich custard cries out for fruit so a light red or white, something grenache or gamay for red and maybe a chenin blanc or unoaked chardonnay for white, but really anything that is softer and fruity will work. So next time you're wondering what to do with that lefover chicken/ham/crab think about a quiche and I bet you'll be happy you did. I love quiche, but after years of trying different recipes I now use Julia Child's all the time. Love it.